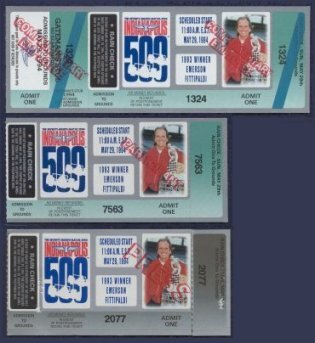 Except for the 1994 and 2003 tickets, the driver/car, logo etc. are now vertical. The winning car does not appear on 1993, 1994, 2001 through 2005 and 2007 tickets. (We need pictures of square general admission tickets from the years not shown. Please send a scan if you have one so it can be posted here on the site.) The ticket printer is Weldon, Williams and Lick through 2005. The 1995 ticket marks the first change in size since 1954 as it now measures 6” x 2 3/4”**. Ticket size increases again to about 6 1/4 ” x 3”*** in 1996 where it will remain so through 2015 (see 2004 below). Also in 1995 a drawing of the winner replaces a picture and this remains so through 2000 where upon a picture returns in 2001. Note that a legal statement now appears on the back of "Complimentary Employee", "Press", "Participant" etc. beginning in 1994. Beginning in 2001, the event logo on some tickets is in relief. With the addition of a bar code to the ticket in 2004, the over all unused ticket size increases to 8 1/2” x 3” but the used ticket size stays the same at about 6 1/4 ” x 3”***. With the exception of 2005 (which is the same as 2003) the over all ticket size remains 8 1/2” x 3” through 2015. The phrase "90th Running" has been cut out vertically from the 2006 ticket (upper right) presumably in an attempt to thwart counterfeiters. The ticket printer Weldon, Williams and Lick is no longer on the ticket for the first time since 1935. The logo for 2007 is embossed at upper left on the 2007 ticket. Although the top and lower middle portions of the 2007 Worker ticket below appear yellow, they are in fact a reflective silver. Although “General Admission $20.00 4081” is printed at the bottom of the 2007 general admission ticket, it also appears to be stamped in the dark green portion at the top. The 2008 ticket has the event logo embossed below Dario’s car. Stubs from 1993 through 2008 become easier to obtain as the you go up through the years. If one had to chose which one or ones are tougher to find than another, the 1997 (the race was postponed twice due to rain) with rain check or unused and in very good condition or better will probably be tougher to find in the future. Rain damage may also have occurred to tickets in other years where rain was an issue: 1996, 2000, 2001 and 2004. ** All measurements are taken from the stub or used ticket. *** The used ticket size may vary slightly year to year but the unused ticket size doesn’t change unless noted.